For decades, academic historians have blasted away at the scriptural authority of Lone Star. 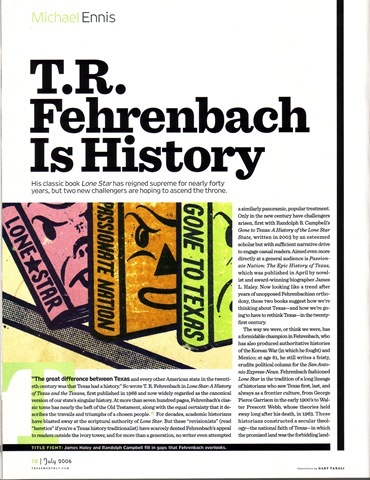 But these “revisionists” (read “heretics” if you’re a Texas history traditionalist) have scarcely dented Fehrenbach’s appeal to readers outside the ivory tower, and for more than a generation, no writer even attempted a similarly panoramic, popular treatment. Only in the new century have challengers arisen, first with Randolph B. Campbell’s Gone to Texas: A History of the Lone Star State, written in 2003 by an esteemed scholar but with sufficient narrative drive to engage casual readers. Aimed even more directly at a general audience is Passionate Nation: The Epic History of Texas, which was published in April by novelist and award-winning biographer James L. Haley. Now looking like a trend after years of unopposed Fehrenbachian orthodoxy, these two books suggest how we’re thinking about Texas—and how we’re going to have to rethink Texas—in the twenty-first century. The way we were, or think we were, has a formidable champion in Fehrenbach, who has also produced authoritative histories of the Korean War (in which he fought) and Mexico; at age 81, he still writes a feisty, erudite political column for the San Antonio Express-News. Fehrenbach fashioned Lone Star in the tradition of a long lineage of historians who saw Texas first, last, and always as a frontier culture, from George Pierce Garrison in the early 1900’s to Walter Prescott Webb, whose theories held sway long after his death, in 1963. These historians constructed a secular theology—the national faith of Texas—in which the promised land was the forbidding landscape west of the Balcones Escarpment (now defined by Interstate 35), and the tribe providentially selected to conquer it was the pluckiest, manliest, most devilishly clever bunch of European white males God ever placed on this earth. As a literary achievement, Fehrenbach’s celebration of the chosen people, whom he dubbed the Anglo-Celts, may never be challenged. In paragraphs as architecturally elegant and idea ornamented as Edward Gibbon’s in The History of the Decline and Fall of the Roman Empire—along with passages almost Homerically poetic—Fehrenbach’s Anglo-Celts stream out of their homeland in Scotland and Ireland, hopscotch across the American South, and bring to a bloody but merciful end three centuries of desultory Hispanic suzerainty over the promised land. The Anglo-Celts don’t stop at the lush coastal plain—any wimp could make it there—but push on inexorably, summoning a courage and ingenuity unprecedented in Western civilization to vanquish the most savage foe of all, the Comanche, on their own arid West Texas turf, which then becomes the quasi-mythical Cattle Kingdom. Reconstruction does throw the Anglo-Celts for a lengthy racist loop, but that’s mostly the fault of Yankee carpetbaggers. By the end of Lone Star, the twentieth-century Texan “had little difficulty in remaining a nineteenth-century man,” and our state was evidently none the worse for it. The thumbnail biographical portraits at which Haley excels are hardly mini-hagiographies—Stephen F. Austin’s letters “revealed relentless self-pity”—and he isn’t afraid to characterize some leaders of the Texas Revolution as “self-interested military amateurs with delusions of grandeur” and their followers as “frontier yahoos.” Haley also immortalizes unlikely players such as Wright Mooar, a nineteen-year-old woodcutter from Vermont, who discovered the market for buffalo hides in 1870. By exterminating their food supply, Mooar probably did more to sweep the Comanche from the Texas plains than all those valiant Anglo-Celt Indian fighters combined. Haley doesn’t devote significantly more words to the twentieth century than does the updated Lone Star, but the march to modernity represents a considerably greater fraction of his trimmed-down 560 pages—and his heart is clearly in it. Almost without precedent in a Texas history, Haley evocatively weaves culture into the tales of political shenanigans and oil booms, sketching out figures as disparate as expatriate author Katherine Anne Porter, actor “Fatty” Arbuckle, and counterculture icon Janis Joplin. 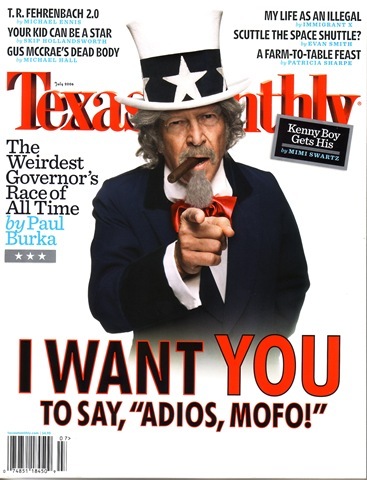 He can be as unsparing of our collective failures as he is of individual foibles, as in this analysis of immediate post—World War II affairs: “The ferocity with which the Texas establishment fought to maintain mastery of the economy and the political landscape seemed continually tied, either directly or tenuously, to race. Even when not debated openly, it was the elephant in the parlor of every political discussion.” In the end, however, Haley is careful to distance himself from the “political correctness” of many revisionists, and the critical defect of Passionate Nation may turn out be its biggest selling point with its intended audience: It undermines the Texas myth more by subtle nudges than direct challenge. That’s not the case with Campbell, the driest stylist of the bunch but without peer at lucidly presenting real history in the harsh light of inescapable facts. A professor at the University of North Texas, in Denton, and a heavyweight among academic historians, Campbell is distinguished by having personally done a lot of the groundbreaking scholarly spadework on which Gone to Texas is based. As our recent school finance spectacle illustrates, twenty-first-century Texas is hoping to educate its future scientists and entrepreneurs via a political apparatus intentionally designed to fail by a bunch of reactionary rubes who were already behind the times considerably more than a century ago. But that’s just one example of why Texas history really does matter—and why it matters that we get it right. The frontier mythology and Lost Cause romanticizing that remain at the heart of old-school Texas history will provide few answers to the problems of this century; as Haley observes, “Texas is an urban colossus facing significant challenges for which its history may not have prepared it.” We will be challenged to fill up our city centers, not spread people out across an endless horizon; to make heroes out of teachers and urban planners instead of trail drivers and Indian fighters; to tell a startling new story in which the chosen people will be Hispanics, again becoming the dominant population after a two-century hiatus. To move forward, we’ll have to accept that our history, however sacred and deeply embedded in our culture (most of us drink the Kool-Aid in seventh-grade Texas history), really isn’t inerrant scripture after all; our perspective on the past changes with time, cultural and political maturity, and new information. Gibbon, for all his brilliance, wasn’t the last word on the fall of Rome, and it’s a good sign of our continued ascendance that Fehrenbach’s literary classic is no longer the last word on the rise of Texas.